When faced with a persistent problem in any Hearing Conservation Program, such as extreme noise exposure, safety managers often use the same cycle of tactics and interventions to solve the problem. Too much noise? Provide workers with earplugs of a higher attenuation rating. Use dual protection (earplugs and earmuffs). Install acoustical enclosures, baffles and dampeners; increase the frequency of machine maintenance; rotate workers in noisy areas on shorter shifts. Then re-measure the ambient noise with sound level meters and dosimeters. If the estimated reduction is insufficient, do the same again - perhaps ad infinitum. In such situations, the solution seems to become the problem and safety managers become frustrated as they face a seemingly endless cycle that yields minimal results and little real-world data. At Dixie Industries, a forging and assembly company based in Tennessee, Ed Tougaw the production manager, was experiencing such problems. However, by applying new technology to create meaningful Hearing Conservation Program tactics he was able to break free from the cycle of failure. Forging is one of the loudest manufacturing processes and at Dixie Industries, employee noise exposure levels can reach 108 to 112dBA. Forging is also a precision process. Tougaw says: "The operators must be able to see and manipulate the product as it is being formed and effective shielding is nearly impossible. We rely on the proper PPE to protect them after the engineering is performed." Dixie Industries'Hearing Conservation Program requires all workers to wear hearing protection throughout the facility, and in the forge area, where exposures average 110dBA throughout the course of a workday, they use dual protection. Over a decade, the operation underwent more than 30 different projects to reduce overall noise, spending more than $1.8m on a variety of different noise reduction solutions, yet a noise problem persisted and Dixie Industries was cited by the local equivalent of the HSE. Solution Tired of working through the same cycle of failure, Tougaw sought alternative methods to document and control the noise exposure problem. He turned to a new technology, QuietDose from Howard Leight, which measures and collects an individual's daily noise exposure dose. Integrated into earplugs or earmuffs, it measures and records the worker's actual noise dose over their entire work shift.When it is worn as hearing protection, it measures sound pressure levels in the interior of the protector. During periods when it is not worn, QuietDose measures ambient noise levels. Overall, it accounts for the ear's actual noise exposure, and provides real-time monitoring throughout the workday. 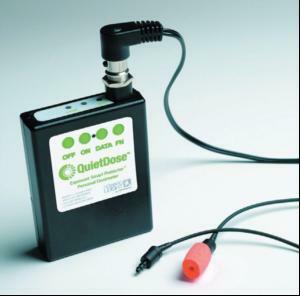 QuietDose's Exposure Smart Protector dosimeter alerts the worker when noise dose approaches or exceeds safe limits, and the data available allows the safety manager to access daily noise exposure reports. Using a QuietDose In-Ear Starter Kit six workers recorded their daily noise dose over several months. Concurrent, ambient noise measurements were also recorded with a sound level meter. Data from both was collected and analysed.Workers using in-ear dosimetry experienced noise exposures under the Personal Exposure Limit and almost all measurements were under 80dBA. Workers exposed to the loudest noise achieved only 25% of their daily dose. The inear dosimetry was able to determine that with proper protection, training and motivation, workers can be adequately protected from extreme noise over an entire work shift - with the numbers and documentation to validate the findings. Dr. Kevin Michael, one of the inventors of the technology, says: "From our field studies, we weren't surprised to see that the workers were adequately protected, especially since they were wearing double protection. In fact, nearly all industrial exposures can be reduced to a safe level with a properly fitted single hearing protector. But, what this demonstrates is that conventional de-ratings can be grossly inaccurate." Data was presented to the local HSE and the citation was abated two months later. Dixie Industries continues to use QuietDose. "The success of our in-ear dosimetry program sent a message that everyone could and should make a contribution to the overall safety environment at Dixie," says Ed Tougaw. He considers QuietDose a 'foundational element of Dixie Industries' overall safety program.